Those words came from OSHA administrator David Michaels in his testimony in favor of the Protecting America’s Workers Act (PAWA). The bill would include public employers under OSHA and increase whistleblower protections. create automatic increases in fine amounts by tying them to inflation. In his testimony before a U.S. House subcommittee, Michaels pointed out that the average OSHA fine is about $1,000. The median fine for cases in which a worker was killed is about $5,900. Michaels went on to point out that other federal agencies have the ability to issue much larger fines for infractions that don’t include human death. For example, the Department of Agriculture can impose a $130,000 fine on milk processors for willful violations of the Fluid Milk Promotion Act. TV and radio stations can be fined $325,000 for indecent language. The EPA can issue $270,000 fines for Clean Air Act violations. Michaels also supports PAWA’s provision to increase the number of criminal prosecutions for workplace deaths and serious injuries. What do you think about Michaels’ assertion that OSHA penalties are too low to matter to most businesses? Should the penalties for the most egregious violations, those that result in serious injury or death, be significantly increased? What about prison time for company managers when a worker is killed on the job? Let us know what you think in the Comments Box below. A couple different things here: How these fines affect the primarily two different areas (construction and manufacturing) are different. For the OSHA Administrator Michaels to put all areas of our economy into one group is misleading and immediately becomes a political statement instead of truth. First, the construction world is entirely different than the industrial manufacturing world. Lets start with the fines themselves: I don’t see nor have I ever seen a contractor express this attitude of pay the fine and proceed with work as usual in the 35 years I’ve been in the safety and health business with 12 of those years as a senior level Federal OSHA Compliance Officer. The only contractors that have the attitude of “Just pay the fine and proceed with work as usual”, come from the federally funded state programs. We have contractors in our state (federal) that come from a (state) program and are literally shut down due to unsafe work conditions. They can’t believe the fines are so high in a Federal OSHA State. I looked up their history and there it was. 150 inspections, 50 in court and/or litigation. The fines they previously received were in the 100 to 500 dollar range. They come to our state and get hit with Willful Citations and 200,000 dollars in fines and they can’t believe it. So the fix needs to be in the state programs…this is where their needs to be an attitude shift from paying low fines. Wake up OSHA we in the Federal Programs get it. Target the problem areas which is the state programs. The second area that is of a primary concern to a contractor is the devastating affect an OSHA citation has on a contractor. Even if they pay 100,000 dollars in fines for a violation that is NOT what affects the overall company even though it hurts like hell. Now listen up OSHA…..When a contractor submits a Prequalification Bid Package to a general contractor, construction manager, or owner there is always pages of questions regarding the contractor’s safety program. Everyone of these prequalification bid packages ask things like; How many times have you been inspected by OSHA in the last three years? How many citations have you received from OSHA? What were the classifications? Describe each of the citations? What have you done to prevent this from happening again? etc. etc. They also ask what is your LWDII Rate? What is your EMR Rate? Submit copies of 300 Logs from the last three years? It’s very very easy to be eliminated from the Qualified Bidder List before you even get started. This is the area where OSHA Citations, fines, classifications, etc. have the most impact on a contractor. Example: Refinery business…most of them require a LWDII Rate of under 5.0 and an EMR rate of less than 1.0. An energy company we recently tried to qualify with required a LWDII Rate limit of 2.0. This is totally ridiculus and is not reality. What happens when prequal packages become this stringent? Contractors will cheat on the forms and they cheat on their 300 Logs. When I was with OSHA I also was the Area Office Audit Coordinator and it was known across the industry that some contractors are messing with the numbers in order to meet the requirments to be on the approved bidder list. This only presents an unfair advantage to those contractors who play with the numbers to get on the approved bidders list. They get the wrong end of the stick no matter how you look at it. The large companies with manufacturing facilities around the country get cited in one area and it affects the entire company across the United States. The government or OSHA should be a little less intrusive with their in your face atttitude and work with these larger industries to bring them into compliance. Enough said. Have to go to work. Good luck and in summary……Federal States…fines are ok where they are at. State Plans…need to wake up or be taken over by the Feds to bring them more in line with the Federal Program. This new administration and their “strong enforcement” attitude is all about citations and if you look at how they want to accomplish this you’ll find it’s all about the money….more money for them to appropriate to where they see fit. Wrong direction, wrong attitude by the government and wrong for our country when we need construction and manufacturing jobs big time. They just don’t get it. It’s all really sad. If OSHA wants to REALLY help workers, a good place to start would be at machinery OEMs. My company was fined on 4 pieces of equipment which were purchased NEW from 3 different OEMs. One was because a hydraulic clamp was not properly guarded, the second was because OSHA determined a guard on a hydraulic shear was not sufficient to protect a worker [with small hands] from getting close enough to the hold-down to prevent a crushing injury, the third [and forth] was a set of drill presses which had a small “port” in the back corners of the guard where someone approaching the presses from the back could theoritically reach into that space and touch the belt pulley. When I asked the OSHA rep why the machinery was allowed to be sold without sufficient guarding, I was told that OSHA doesn’t go to the OEMs and determine their product safety. With that said, we had to cut a $2,000.00 check to them on top of the cost of the machinery. As a follow-up, the horizontal bandsaw with the hydraulic clamp required the company to violate the warranty to fix the situation as we had to open the control panel and replace switches to reverse the compression rate so when the close button is released it immediately stops. Per the OEM, this violated our warranty. The truth is that compliance is rarely achieved without enforcement. Now more than ever, smaller companies are erring on the side of noncompliance to complete jobs expediently and with minimal cost to the employer. Citations and fines are designed to deter companies from repeatedly placing employees in harms way and also to deter other companies from following in the same path. The logic that the life of an employee should be worth more than clean air is sound. Corporations operating in a safe manner does not have to ruin their bottom line. The attitude that government has no place in business, is just a means of distracting from the real issue. OSHA has lost its teeth over the years with budget cuts that impact staffing and when fines have not increased since OSHA’s inception, the message to corporations is clear…operate as you like and OSHA fines are just the cost of doing business. The truth is that corporations that are complying with the law do not have anything to worry about, even if they have serious accidents or injuries on the job. A high LWDIR within a corporation is a symptom of poor safety management and lack of committment to the general duty clause. It is also a warning sign that something serious is likly on the horizon. I’m thankful to say that I have never worked for an employer who felt it was more economical to pay OSHA fines rather than fix any problems that came to light. There must be places like that out there somewhere because I keep reading about them. But the people I know who deal with safety are quite aware that the costs of injuries far exceed the cost of OSHA fines, so it is always to the employer’s advantage to fix problems before an injury occurs if at all possible. Having injured employees off work hurts them and hurts the business…it’s a no win situation. Having healthy, uninjured employees at work in a safe environment being productive is good for both the employee and the business. Risking employee safety isn’t good for productivity, morale, or the bottom line, just to mention a few things. It makes good business sense to be proactive. While I do believe there have to be basic laws and requirements in all areas related to employment, in my opinion, the government, especially lately, has gone too far. We appear to be well on our way to becoming a socialist country and that concerns me deeply. I hope I’m wrong. We seem to have way too much government control these days and more on the way. I don’t see this as positive. I agree in concept with Mongo1967. OEMs do sell lots of equipment that does not comply with machine guarding, etc. But the problem is that OSHA’s charter as a division of the Department of Labor is to regulate the employer-employee relationship. The Department of Commerce or even the Consumer Product Safety Commission (if you viewed the purchasers and their employees as the consumers for machine tooling) would have more teeth. 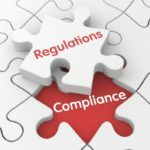 The bottom line is that a manufacturer of a piece of equipment should be required to state the level of compliance of their product for a specific use. It is then the employer’s responsibility to use equipment in accordance with it’s intended purpose. A manufacturer can build a great product that complies with everything but then the employer can install it for a different purpose (e.g., non-explosion proof motor in a flammable environment) so you can’t across the board blame the OEMs. Employers need to understand what they are installing. If the intended use isn’t very specific, then unfortunately it does fall on the employer to modify that equipment before releasing it for use in the workplace. As an EHS professional that has worked for many years in one of the few successfil companies that has been around for over a century in the US, we have to retrofit 30 and 40 year old machine tooling to comply with current standards every day. Whether new or old, what you allow your employees to use must comply with the safety standards in place at the time you let them use it for the purpose they use it. That’s why we have jobs. As to higher fines, whatever. Fine amount, high or low, does not drive us to our decisions. For those employers, and I agree that the Construction industry is worse in this area but many manufacturing companies also need some prioritization help often, I say if they don’t have the right focus, don’t work there. OSHA has more ability to levy fines than this article implies. There are per violation per day capabilities that they just don’t pursue. Whether too lazy, too understaffed, too willing to hire untalented compliance officers, or unable to pay for qualified staff, OSHA is driven by metrics of citations and citations being upheld. If they aren’t willing to go for the throat, then they will never get the throat. Fines only improve safety if you get them. OSHA can not inspect and fine all of the work places, therefore using this strategy has very limited results. It should be part of their strategy but they should devote more time to outreaching smaller companies that will never get fined in their lifetime. The should be providing assistance to smaller companies and helping them implement safety programs that will make them more profitable and efficient. When small companies get a fine they will get a lower fine due to financial hardship and continue doing work without correcting the problem. Instead of fining them, force to provide training to workers and implement a safety program. This will do a lot more for worker safety than a fine. With respect to OSHA helping small companies – they used to do that. This administration canceled that program and, instead, hired more compliance folks. This legislation is just another ploy to get money to fund all the other waste – like ‘stimulus programs’ and the like. The EPA is going to be a nightmare, as well. The fines in both agencies are going through the roof. These fines and such are really thinly-disguised taxes on industry that will do nothing for either safety or the environment. And if you like these programs, just wait until you do the math on what we will have to do for the so-called healthcare programs. Caterpillar, for example, just said that they estimate $100 million increased costs across their companies. If you really want to have fun, come work with us in the oil and gas industry. The effect of all these regulations are staggering. The current administration hasn’t canceled the assistance programs. They’ve cut their budgets and transferred employees from assistance to compliance. However, programs like VPP still exist and have many active participants. Fred – OK, I stand corrected. However, in my mind, canceling budgets and transferring people is the same thing, wrapped in Beltway-Speak. If [my oil company] takes away my money and my troops, then I’m ‘outta bidness’ (as we say in Texas). I believe that VPP will be in the same boat, sooner rather than later. Big fines get publicity. They also instill fear. OSHA counts, in part, on the fear factor to motivate companies into getting their safety practices in compliance. Even then, when inspected, a company will likely be fined. I’ve never experienced an inspection that did not result in some level of fine. Some were justified, others were questionable. Do inspectors see it as their duty to find something wrong in every company they inspect? Do they have to answer to a higher-up if they find no violations in a company they inspected? Is an inspector not issuing a citation seen as not doing their job thoroughly enough? I can attest to some fines issued for some very minor “infractions.” For example, an inspector wanted to see a company’s lockout/tagout authorized training certifications. He requested a specific employee demonstrate the LOTO procedure for his machine. The employee demonstrated the procedure flawlessly. The company was fined because the employee did not sign the training document. The inspector selected that particular employee because he noticed the document was not “properly” signed. The company argued that the point of training was to ensure proper procedures were followed by those certified to perform LOTO and the selected employee demonstrated his knowledge of and accordance to those procedures. Under appeal, the fine was reduced, but not eliminated. And, no, there is no more to the story.